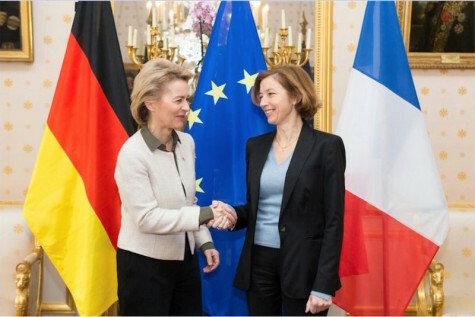 “On the Système de Combat Aérien Futur (Future combat air system, SCAF), an important milestone will soon be reached with the agreement between the French and German air staffs on a “High-Level Command Operational Requirement Document” (HLCORD) setting a common military requirement,” Parly said in a statement released late Thursday. “I am hopeful that in late April, at the ILA air show in Berlin, we will be able to materialize a significant first step,” Parly said in an interview posted by La Tribune website on April 5. “We will then have to define the industrial aspects of this ambitious project which will structure the French and German air forces of the 2040s, replacing Eurofighter and Rafale,” the Armed Forces Ministry statement added. The SCAF project is a bilateral effort agreed by the French-German Defense and Security Council in July 13, 2017. It is separate from the French-British Future Combat Air System (FCAS) program launched with the United Kingdom to develop an unmanned combat air vehicle (UCAV) for the end of the next decade. In the La Tribune interview, Parly expressed her “confidence that we will continue to advance with the Germans on the SCAF; discussions are intense between the French and German teams, and the manufacturers are working well together.” However, she said that the French-German program must be well-established before it is opened to other European partners. “With the British as with the Germans, I am absolutely convinced that what we are doing will be extremely useful for setting out the route map for future air forces,” she added. On the EuroDrone MALE program -- previously known as EuroMale -- a full-scale development and production contract will be awarded in 2019, with deliveries to follow in 2025, the ministry statement said. France currently plans to buy four EuroDrone MALE systems, on which Dassault, Airbus and Leonardo are cooperating. It is expected that other European countries, including Italy and Spain, will continue in the program’s next phase after having participated in its feasibility study. The two ministers also discussed other cooperative programs “that are as important for European defense” during Thursday’s meeting, the seventh they have had since Parly was appointed in July 2017. These include maritime patrol, for which initial study contracts will be awarded to industry in 2019, with initial orders to follow in 2025; the mid-life upgrade of the Tiger combat helicopter and the future French-German main battle tank.